VISTA–The Vista Fire Station One has a new four-legged member. 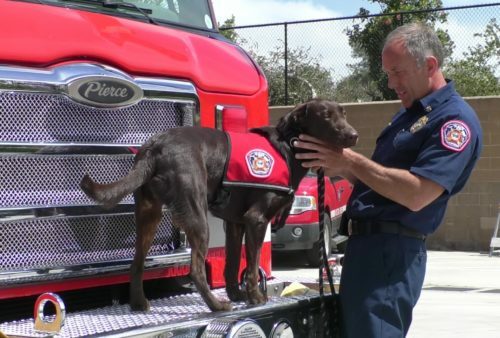 During an official ceremony at the fire station, the department introduced Clifford, a two-year-old chocolate Labrador Retriever, as its new well-being ‘tool’ for firefighters who often deal with occupational stress as a result from their job. David Greene of Performance K9 Training and Thor’s Hope Foundation “handed off” Clifford to his new handler, Vista Deputy Fire Chief Ned Vander Pol. Deputy Chief Vander Pol’s integration of his trained, therapeutic facility dog, Clifford, to the Vista Fire Department is expected to help reduce workplace occupational stress. Firefighters witness more trauma than the average person and Clifford will be used as an additional approach to help Vista firefighters relax and unwind from the stresses of the job. A facility dog is expertly trained in obedience and specialty cues and is used in work settings under the direction of a professional partner or handler. The handler is trained in specific techniques which enable the dog to maintain a calm and polite manner in all situations and to be adaptable to interactions with a variety of people in different situations. In addition to Clifford’s training, Greene has had training sessions with Clifford and Vander Pol and describes both the dog and handler as the perfect match. Clifford is the first facility dog used to provide comfort and emotional support to firefighters in the San Diego region. Deputy Chief Vander Pol owns the dog and will be organizing the site visits and other activities for Clifford. Thor’s Hope Foundation was established in 2013 as a private foundation providing mobility service dogs and trained facility dogs for an array of therapeutic benefits. Through education and public outreach, the foundation dedicates itself in increasing awareness regarding the value service dogs bring.